I am curious by nature, and each time I am going to buy a new product I always check if someone has already hacked it in some way I may like. I like the idea to extend the feature set that the manufacturer has thought of when designing the product. Truth is that this is possible only with a limited number of products. Often it’s also needed a good degree of ‘hacking’ skills not to brick your new toy. Just think about what people has done with hacked Kindles, or WiFi routers or have a look at the Spacepirates Wiki to find some ideas. 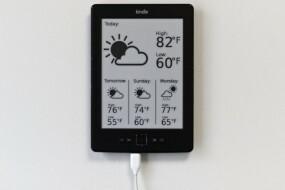 Below you can have a look at a Kindle hacked to be a weather station. I love this Kindle hack for two reasons. First it’s simply gorgeous. Second it’s not built upon old hardware but Matthew built it from a brand new Kindle. I think this is just a clear example of what I am talking about in this post. Another thing I love about this is that you can bring new life to old stuff without the need to waste it. It’s like injecting a new soul to a dead body. Unfortunately all electronics out there is not designed to allow you to do this. The question is: why? Short answer is that you will increase support costs, you will need a new approach to warranty and you will have to deal with a whole new class of customer requests. Isn’t it about time to think about consumer products in a different way? What if they were originally designed to be augmented in their functionality from the very beginning? What if vendors open their internals and publish SDKs and HDKs for those who want to tinker the product? I think each product should have an ecosystem around it. All products must not be ‘fire and forget’ products. This kind of approach would be greatly beneficial to hardware manufacturers. It will increase the probability of selling the product and will create an innovation loop external to the company. Sure, not all users are able today to hack their devices, and that’s why it’s just too complex. What if things were as simple as installing a new app on their smartphone? So, why don’t we think about a startup that can hack your old or new gadgets for a fee?